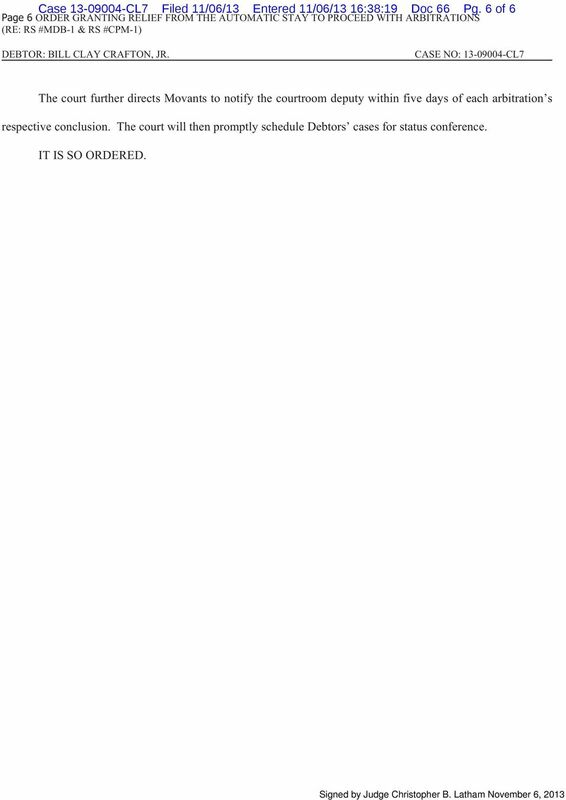 Download "Case 13-09004-CL7 Filed 11/06/13 Entered 11/06/13 16:38:19 Doc 66 Pg. 1 of 6"
2 Case CL7 Filed 11/06/13 Entered 11/06/13 16:38:19 Doc 66 Pg. 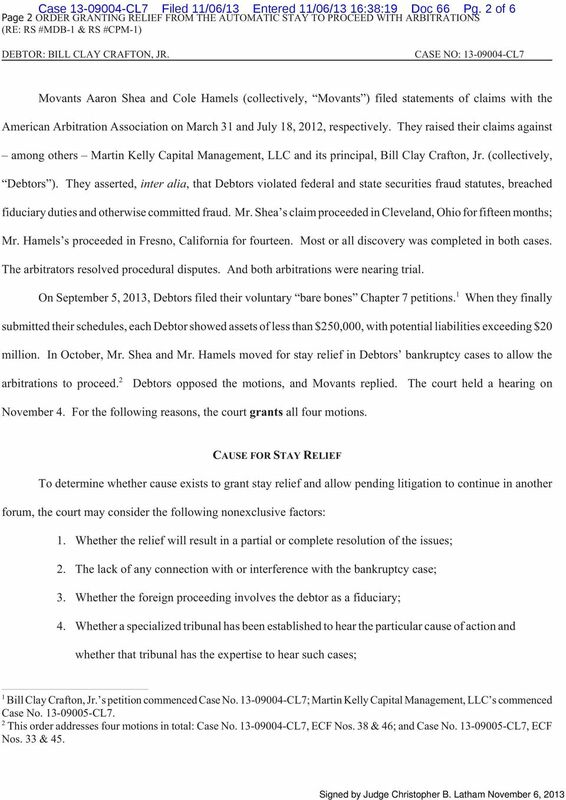 2 of 6 Page 2 ORDER GRANTING RELIEF FROM THE AUTOMATIC STAY TO PROCEED WITH ARBITRATIONS Movants Aaron Shea and Cole Hamels (collectively, Movants ) filed statements of claims with the American Arbitration Association on March 31 and July 18, 2012, respectively. They raised their claims against among others Martin Kelly Capital Management, LLC and its principal, Bill Clay Crafton, Jr. (collectively, Debtors ). They asserted, inter alia, that Debtors violated federal and state securities fraud statutes, breached fiduciary duties and otherwise committed fraud. Mr. Shea s claim proceeded in Cleveland, Ohio for fifteen months; Mr. Hamels s proceeded in Fresno, California for fourteen. Most or all discovery was completed in both cases. The arbitrators resolved procedural disputes. And both arbitrations were nearing trial. On September 5, 2013, Debtors filed their voluntary bare bones Chapter 7 petitions. 1 When they finally submitted their schedules, each Debtor showed assets of less than $250,000, with potential liabilities exceeding $20 million. In October, Mr. Shea and Mr. Hamels moved for stay relief in Debtors bankruptcy cases to allow the arbitrations to proceed. 2 Debtors opposed the motions, and Movants replied. The court held a hearing on November 4. For the following reasons, the court grants all four motions. 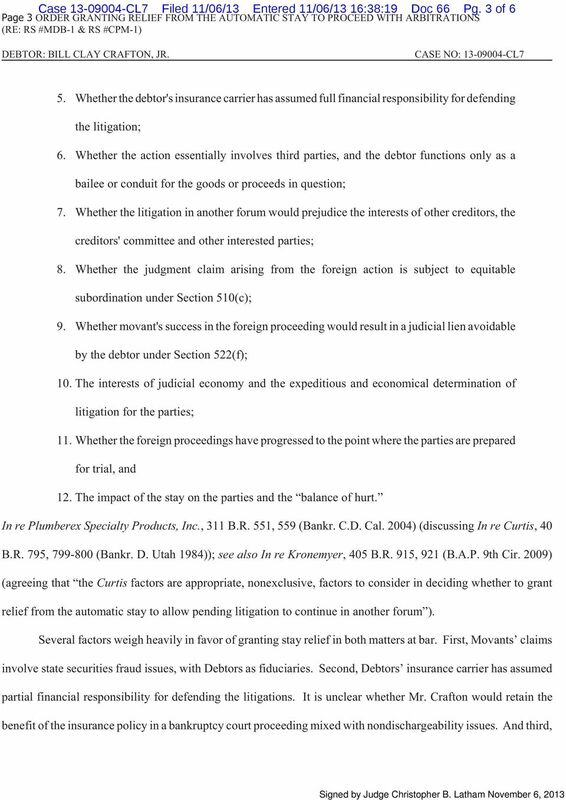 CAUSE FOR STAY RELIEF To determine whether cause exists to grant stay relief and allow pending litigation to continue in another forum, the court may consider the following nonexclusive factors: 1. Whether the relief will result in a partial or complete resolution of the issues; 2. The lack of any connection with or interference with the bankruptcy case; 3. Whether the foreign proceeding involves the debtor as a fiduciary; 4. Whether a specialized tribunal has been established to hear the particular cause of action and whether that tribunal has the expertise to hear such cases; 1 Bill Clay Crafton, Jr. s petition commenced Case No CL7; Martin Kelly Capital Management, LLC s commenced Case No CL7. 2 This order addresses four motions in total: Case No CL7, ECF Nos. 38 & 46; and Case No CL7, ECF Nos. 33 & 45. 5 Case CL7 Filed 11/06/13 Entered 11/06/13 16:38:19 Doc 66 Pg. 5 of 6 Page 5 ORDER GRANTING RELIEF FROM THE AUTOMATIC STAY TO PROCEED WITH ARBITRATIONS unlike the In re Eber arbitration, Movants arbitrations have progressed rapidly for over a year. 3 Finally, unlike the bankruptcy court in In re Eber, this court has not found that Movants are stealthily seeking to have an arbitrator decide nondischargeability. 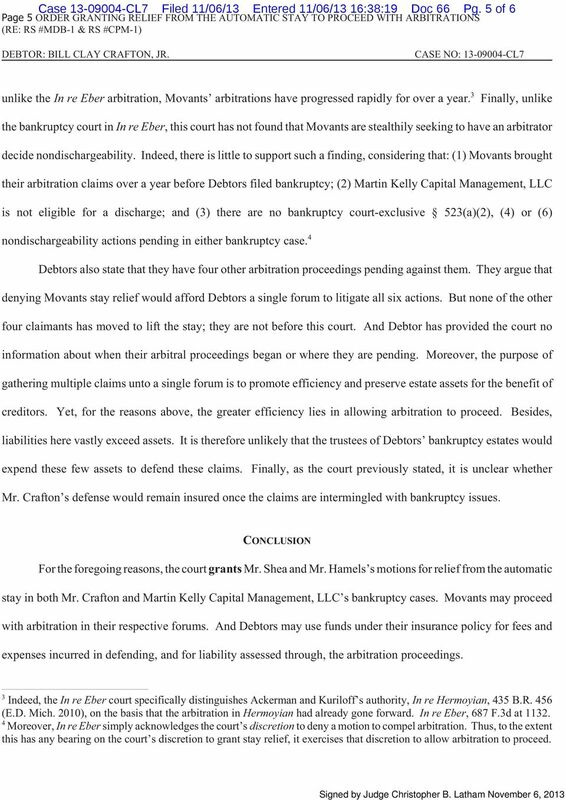 Indeed, there is little to support such a finding, considering that: (1) Movants brought their arbitration claims over a year before Debtors filed bankruptcy; (2) Martin Kelly Capital Management, LLC is not eligible for a discharge; and (3) there are no bankruptcy court-exclusive 523(a)(2), (4) or (6) nondischargeability actions pending in either bankruptcy case. 4 Debtors also state that they have four other arbitration proceedings pending against them. 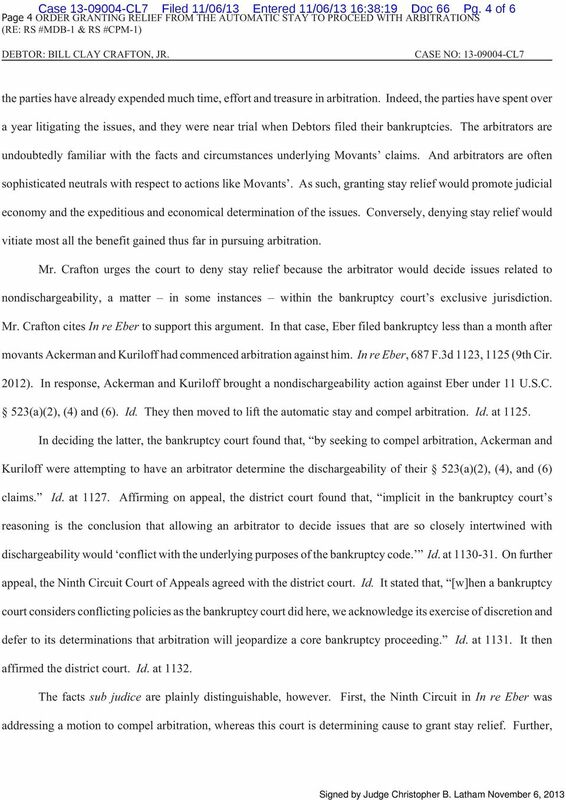 They argue that denying Movants stay relief would afford Debtors a single forum to litigate all six actions. But none of the other four claimants has moved to lift the stay; they are not before this court. And Debtor has provided the court no information about when their arbitral proceedings began or where they are pending. Moreover, the purpose of gathering multiple claims unto a single forum is to promote efficiency and preserve estate assets for the benefit of creditors. Yet, for the reasons above, the greater efficiency lies in allowing arbitration to proceed. Besides, liabilities here vastly exceed assets. It is therefore unlikely that the trustees of Debtors bankruptcy estates would expend these few assets to defend these claims. Finally, as the court previously stated, it is unclear whether Mr. Crafton s defense would remain insured once the claims are intermingled with bankruptcy issues. CONCLUSION For the foregoing reasons, the court grants Mr. Shea and Mr. Hamels s motions for relief from the automatic stay in both Mr. Crafton and Martin Kelly Capital Management, LLC s bankruptcy cases. Movants may proceed with arbitration in their respective forums. And Debtors may use funds under their insurance policy for fees and expenses incurred in defending, and for liability assessed through, the arbitration proceedings. 3 Indeed, the In re Eber court specifically distinguishes Ackerman and Kuriloff s authority, In re Hermoyian, 435 B.R. 456 (E.D. Mich. 2010), on the basis that the arbitration in Hermoyian had already gone forward. In re Eber, 687 F.3d at Moreover, In re Eber simply acknowledges the court s discretion to deny a motion to compel arbitration. Thus, to the extent this has any bearing on the court s discretion to grant stay relief, it exercises that discretion to allow arbitration to proceed. 6 Case CL7 Filed 11/06/13 Entered 11/06/13 16:38:19 Doc 66 Pg. 6 of 6 Page 6 ORDER GRANTING RELIEF FROM THE AUTOMATIC STAY TO PROCEED WITH ARBITRATIONS The court further directs Movants to notify the courtroom deputy within five days of each arbitration s respective conclusion. The court will then promptly schedule Debtors cases for status conference. IT IS SO ORDERED. UNITED STATES BANKRUPTCY COURT FOR THE MIDDLE DISTRICT OF TENNESSEE MEMORANDUM IN SUPPORT OF MOTION FOR RELIEF FROM THE AUTOMATIC STAY I. 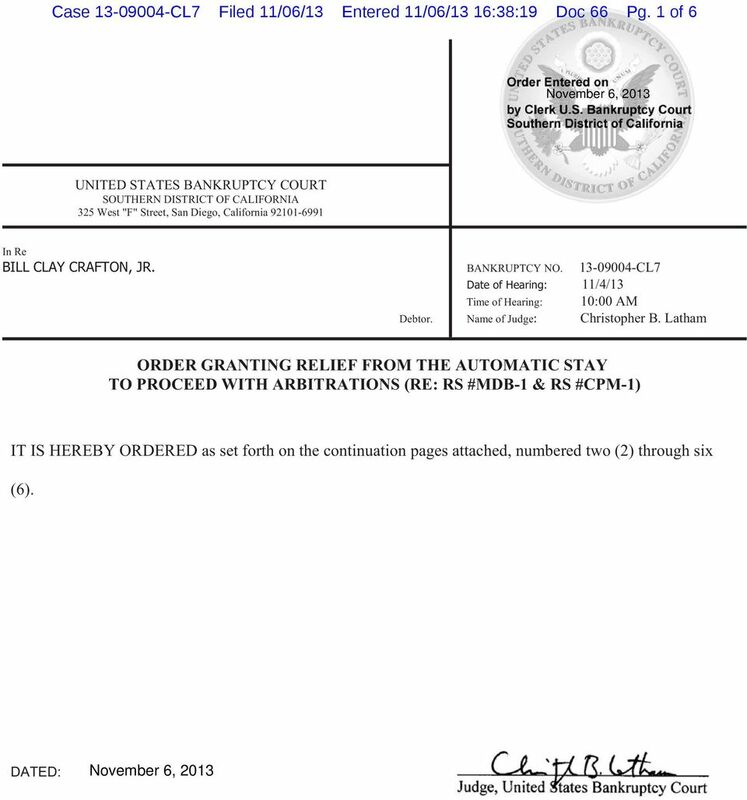 Page 1 of 10 FOR PUBLICATION UNITED STATES BANKRUPTCY APPELLATE PANEL FOR THE FIRST CIRCUIT BAP NOS. MW 06-025, 06-029 Bankruptcy Case No. 04-43698-HJB FREDERICK J. CROCKER and MAUREEN O. CROCKER, Debtors. UNITED STATES COURT OF APPEALS FOR THE NINTH CIRCUIT. The memorandum disposition filed on May 19, 2016, is hereby amended. Argued and Submitted on June 24, 2004. Filed Sept. 30, 2004. 08-12520-mg Doc 33 Filed 02/25/13 Entered 02/25/13 16:16:48 Main Document Pg 1 of 13. Debtor.